Life-cycle assessments — a technique used to quantify the impact of these gases — showed that GHGs were 2.36 kg CO2e/kg for chicken, which is considerably lower than the 3.4-4.2 kg CO2e/kg seen for pork or 14.8 kg CO2e/kg for beef.2,3 Still, it’s important for the poultry industry to understand GHGs and how minimizing them can reduce costs as well as protect the environment. Dunkley teaching children about poultry incubation and care after hatching during an Agricultural Awareness day at the university. Before we begin, it should be noted that the majority of GHGs associated with poultry don’t originate from poultry production at all. They’re associated with feed production, which the poultry grower can’t control. However, producers can do their part by monitoring and controlling on-farm GHG emissions — an effort that will benefit flocks and farm profitability, as well as the environment. The first step is to determine your farm’s “carbon footprint.” The measure used to express this is CO2e, which means carbon dioxide equivalent. It includes CO2 as well as other GHG emissions based on their relative global warming potential (GWP). As an example, consider that over a 100-year period, the GWP for N2O is 298.4 This means the emission of 1 million tons of N2O is equivalent to 298 million tons of CO2 over 100 years. The GWP over 100 years for CH4 is 25, making CH4 25 times as potent as CO2. Poultry producers can now calculate the carbon footprint of a farm by utilizing the Poultry Carbon Footprint Calculation (PCFC) tool. Developed by the University of Georgia, the PCFC tool is an Excel spreadsheet (Figure 1) where poultry producers can input a farm’s information. This includes the number of houses, type of birds grown (e.g., pullets, broilers or breeders), and the amount and type of fuel used for the period tested. The amount of electricity used is also entered. The tool then calculates the GHG emissions of the farm. The emissions are divided into emissions from mechanical and non-mechanical sources.5 The mechanical sources are further divided into electricity use and fuel use (liquid petroleum gas or diesel gas). The tool includes strategies for eliminating or lowering emissions on a farm with high readings. Producers can select the changes listed based on the needs of their farm. The tool makes the new calculations, displaying the results under “Projection Year.” The producer is then able to compare the current year’s emissions with the projected year. The tool also produces a comparison chart and a percentage chart to show the percent reduction made after the recommendations are applied. Our research has shown that about 90% of emissions from poultry-production farms — specifically, grow-out and pullet farms — comes from fuel use. On layer and breeder farms, most emissions — 66% — come from manure management (Figure 2). The results also indicate that the total carbon footprint from broiler grow-out farms is higher than that of pullet and breeder farms. Pullet farms had more emissions than breeder farms. These differences are due to the production practices of each type of facility. Broiler and pullet farms utilized more fossil fuel for heating the houses during the brooding period. 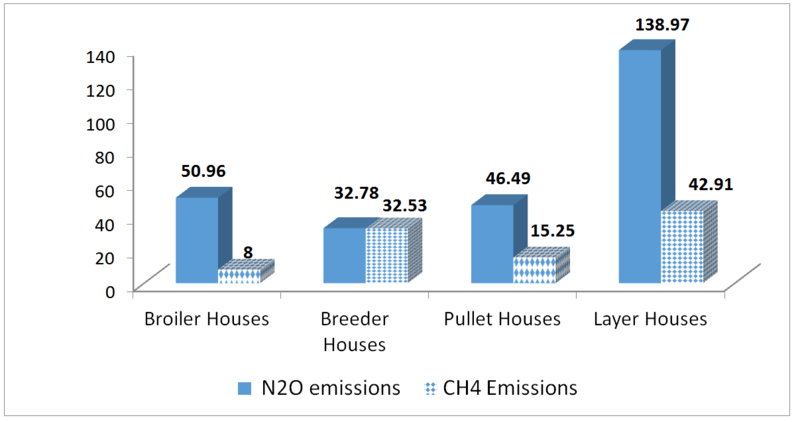 The breeder and layer facilities had higher emissions from manure management (Figure 3). Based on the results, it’s reasonable to focus your abatement and mitigation strategies on fuel-intensive areas, which include heating needs, incineration of dead birds and the operation of farm equipment such as generators and vehicles. For example, fuel use in poultry houses with curtain sides can be reduced by enclosing curtain openings with solid walls. Fuel use can also be reduced by replacing tunnel inlet curtains with insulated doors or by replacing pancake brooders and/or furnaces with radiant-heating systems. Another fuel-reducer is replacing pilot-lit radiant brooders with spark-ignition brooders. These types of changes not only reduce the energy use and GHG emissions on a farm, they improve the environment for birds inside the houses by reducing the amount of CO₂ emitted. They also reduce fuel costs for producers. Click here for more information on the Poultry Carbon Footprint Tool and other publications on GHG emissions from poultry production. 1. Johnson, JM, et al. Agricultural opportunities to mitigate greenhouse gas emissions. Environ. Pol. 2007;150:107-124. 2. Pelletier N. Environmental performance in the US broiler poultry sector: Life cycle energy use and greenhouse gas, ozone depleting, acidifying and eutrophying emissions. Agri. Systems. 2008;98:67-73. 3. Environmental Working Group. 2011. Hamerschlag, K. and K. Venkat. Meat eaters guide: Methodology. 4. Penman J, et al. 2006. Intergovernmental Panel on Climate Change (IPCC). Guidelines for national greenhouse gas inventories. 5. Dunkley C, et al. Carbon footprint of poultry production farms in South Georgia: A Case Study. J Appl Poult Res. 2015;24:73-79.